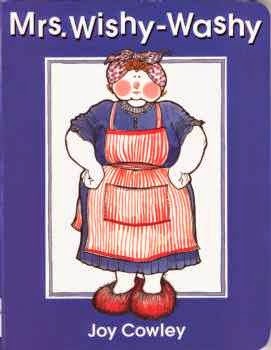 Written by Joy Cowley and Illustrated by Elizabeth Ann Fuller. "Oh look at you!.. In the tub"
"In went the Duck, wishy-washy, wishy-washy"
A great book for repetitive vocabulary, especially with our younger ones. Fill the sink with warm soapy water (or the bathtub) and re-enact the book with washable toys from around the house. If they're in the bathtub, you can read the book to them from a safe distance as they follow along with the toys. When it's time to do dishes, you can do an extender: "In goes the bowl, wishy-washy, wishy-washy", "In goes the spoon, wishy-washy, wishy-washy".